When all is said and done, we all want a safe place where we can rest, take in the air and just meditate while sipping your coffee or juice. I cannot think of any place that would be perfect for this than in your backyard or by that pool in your compound. Lying or sitting under the scorching sun is however more likely to bring you more restlessness than rest. And now, we will show you some ideas to choose the best cantilever umbrella for wind in this summer. What to Look For While Buying The Best Cantilever Umbrella. 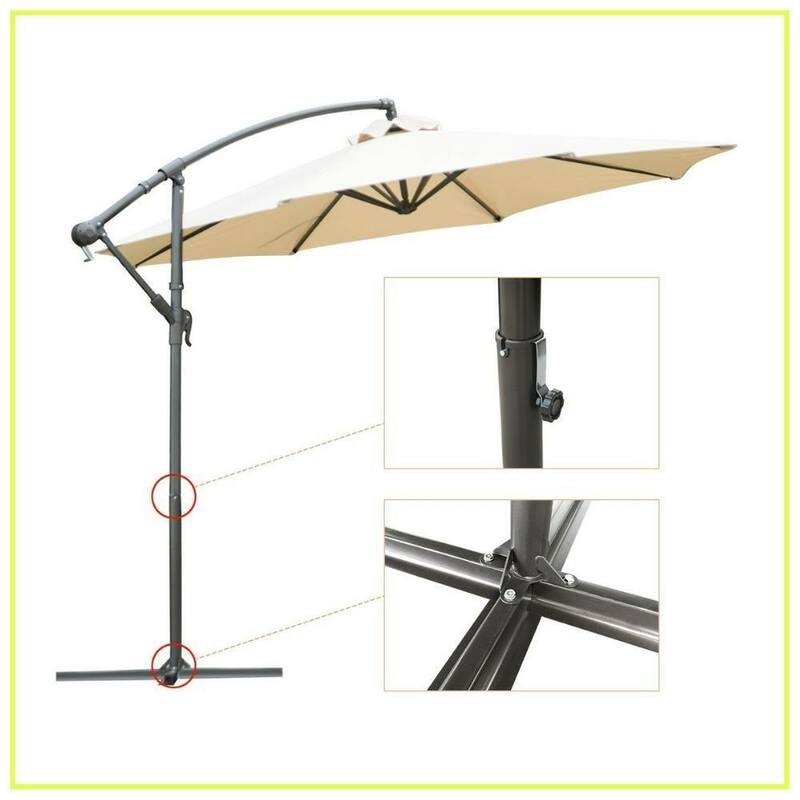 How to Use Cantilever Umbrella? Dienspeak Deluxe Aluminum Cantilever Umbrella is an offset outdoor market and garden hanging umbrella sunshade with a free standing design that provides an enough shade for up to 75square fee at most of any sunny spot at the height of 8ft. Its fabric, 100% spun polyester blocks up to 98% of UV rays. This results in it reducing the area's temperature by up to 32%. It has a 2-year guarantee of fade, mold and mildew resistance. Its 1.9-inch aluminum that is free-powder coated resists corrosion. It also allows easy operation and handling due to its lightweight. Dienspeak deluxe cantilever umbrella has crank handles hence allows convenient folding and unfolding to different heights adding a plus to its easy handling. ​Its round shape canopy that has a diameter of 10ft has steel ribs that are coated with a bronze powder that keeps them from chipping off, peeling, rust and even corrosion. This also applies to its pole. It has a cross-base that needs weights of about 200lbs to secure it. It comes in three colors; coffee, burgundy, and beige. One of the best things you can add to your backyard is Elite Shade Sunbrella Patio Umbrella. This cantilever umbrella is made from high-class materials. It is made from highly resistant and fade-mildew fabric Sunbrella. Sunbrella is a fabric which is 100 % solution dyed. It protects you from the bad rays of the sun. It offers you optimal protection for the blazing heat. The best thing is that it restricts 98% of the UV rays. The amazing thing about Sunbrella Umbrella Base is that it is recommended by the Skin Cancer Foundation. This cantilever umbrella comes with a dual ventilation system. It has amazing capabilities to release the wind. The 3 layer canopy Sunbrella Umbrella gives you maximum protection from the wind. Even if the weather is blowy, you don’t have to worry about the umbrella flying away. Moreover, this Elite Market umbrella comes with a crank open system. Opening and closing the cantilever umbrella is a piece of cake. You can do it without any trouble. It also comes with a weather-resistant Sunbrella umbrella cover which prevents it from fading away. Umbrella frames or fittings and accessories are very well-made. They make it quite durable and strong. It comes with a durable aluminum pole with 8 ribs. You can conveniently tie it up with a strap and protect it from wind and rain when you are not using it. It comes with a push button which lets you tilt the umbrella with ease for more shade. The aluminum pole gives it strong and sturdy support. It comes with a rust-free powered coating which prevents it from corroding. It is a 9 ft long umbrella with 8 ribs. There is no base included. You have to buy the base separately. Your backyard is an integral part of your house. It’s the area where you gather with your friends and family to have fun. It is one of the best places in your house to entertain your guests by throwing a BBQ party. Purple Leaf Deluxe 10 foot Patio Umbrella would allow you to provide safe shelter from the hot sun and unexpected rain. You’ll be able to stay outdoors for longer with your friends and family. 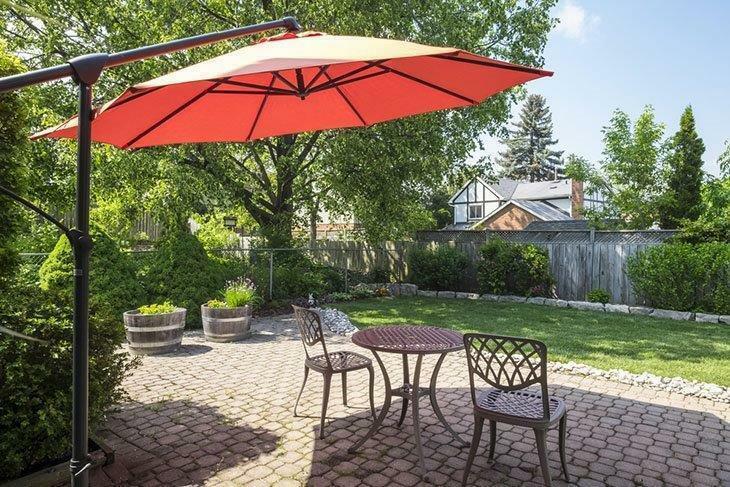 Not only this cantilever umbrella provides you an adequate amount of shade, but it also adds a touch of sophistication in your backyard. It makes your outdoor lounging area even more appealing and attractive. Purple Leaf Deluxe 10 foot Patio Umbrella comes with a double top canopy design. It saves you from the sweltering heat of the sun. Whether you are looking for a cantilever umbrella for your house or for the beach, this is the perfect choice for you. You can use it for residential and commercial purposes. You can easily control the shading area with the 360 degrees rotating mechanism. You don’t have to deal with any complicating tilting mechanisms. Just rotating it on the side where you want the shade to be is enough for you to enjoy the sun outdoors. The unique crank system and handle design makes it hassle free for you to open and close it. It comes with a cover which makes it easier for you to store it. The pole is made from sturdy aluminum which makes it long-lasting and durable. The fabric is 100 % polyester which is UV-resistant and wind-resistant. Mounting it in your patio could be an issue for you. Purple Leaf Deluxe Square Patio Umbrella lets you have a relief from the sun in your patio. It offers you an ample amount of shade to enjoy the summer weather. You are able to stay cool in the shade. This cantilever Umbrella is perfect for your patio, poolside, and beach resorts. 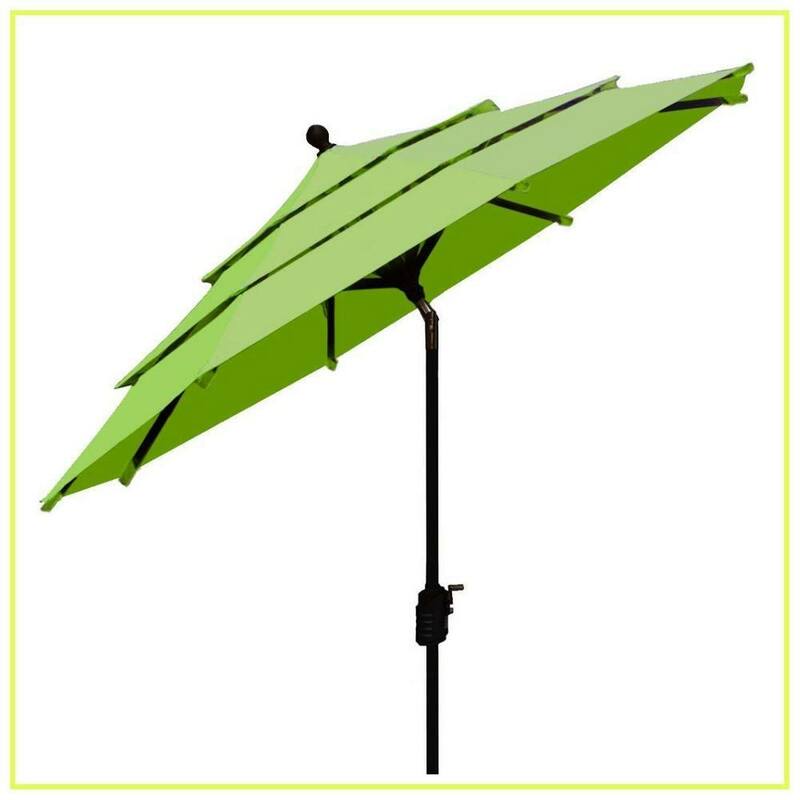 It is an ideal cantilever umbrella which keeps you away from the strong rays of the sun. Purple Leaf Deluxe Square Patio Umbrella is innovatively designed with the perfect combination of functionality and style. This 9 foot square patio umbrella comes with a double canopy design. It becomes the centerpiece of your patio or backyard. It would allow you to stay outdoors for a longer period of time. This cantilever umbrella comes with a unique crank system. It is simple to operate the umbrella. You can conveniently open and close it. For your convenience, it comes with a rotating mechanism. You can smoothly rotate it around to enjoy enough shade coverage. Moreover, it comes with aluminum bones and ribs. You are able to use it for years to come. It gives you the ultimate protection from the rays of the sun. The double top design of the cantilever umbrella gives you optimal ventilation. The 100% polyester fabric protects you from the UV rays. ​It only tilts in one direction. You have to buy the base separately. If you want to cover a large area, this is the best cantilever umbrella. You can lounge and laze with your friends and family at your backyard under this umbrella. It gives you an ample amount of shade to cover 6 to 8 seats with a rectangular or oval table. The polyester fabric has a tendency to deal with harsh weather conditions. It won't disintegrate when the weather is not at its best. Abba Patio Cantilever Umbrella is a top-class patio Umbrella. What sets it apart from its competitors is its 5-position tilt mechanism. You don’t have to feel uncomfortable in the sun. The easy to operate tilt mechanism lets you have the shade where you want. You can conveniently make the tilt adjustments while sitting. Moreover, it is easy for you to open and close the umbrella with the hassle-free crank system. The double canopy design gives it optimal ventilation. The polyester fabric is heat resistant. It protects you from the UV rays of the sun. You can make easy angle adjustments with the 5- position tilt mechanism. It comes with a bronze powder coating which prevents it from chipping off. You have to buy the weights separately. It does not stay sturdy without weights. If you are looking for a stylish patio umbrella for your house, Sorara Cantilever Patio Umbrella is a perfect choice for you. 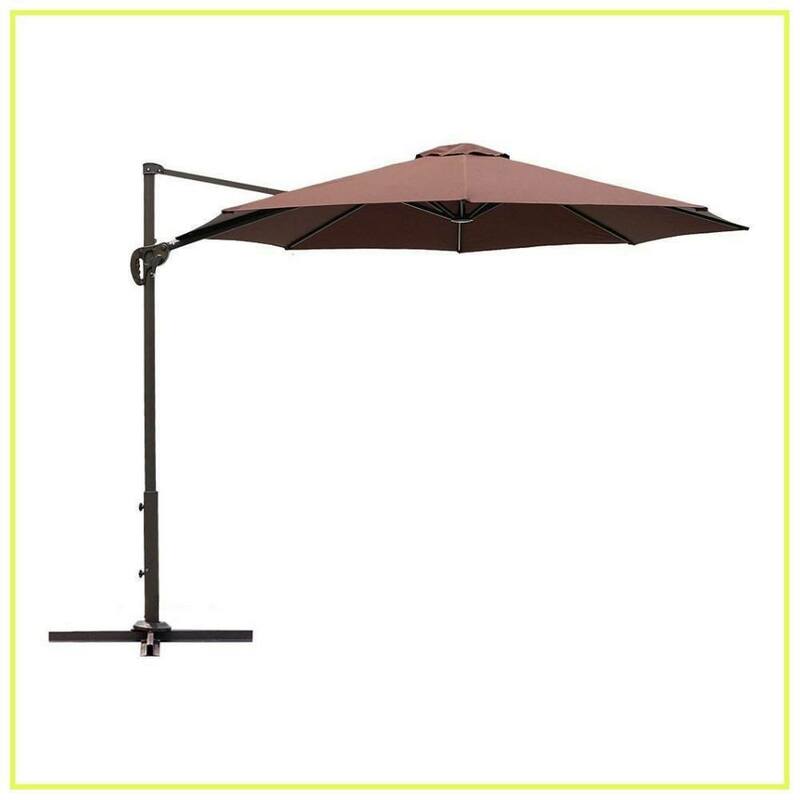 This is a top-class cantilever umbrella which adds a touch of luxury and elegance in your patio. It not only gives you an ample amount of shade, but it also adds to the beautification of your patio. This patio umbrella offers you amazing flexibility. You can cover large dining areas in your outdoor garden. The double canopy design of the umbrella keeps you properly ventilated. The polyester fabric is made from gives you 98% UV protection. What more do you want? The best thing about this patio umbrella is that it comes with a base and weights. You don’t have to buy them separately. This feature surely makes it the best choice for you. Installing it in your patio takes just a few minutes. The instructions are quite direct and straightforward. It only requires the efforts of one man to install it. This umbrella comes with an easy to open and close crank system. Cleaning the umbrella is super easy. You only need to wipe the fabric off with a wet cloth. It comes with a PE storage cover. You can conveniently store it when not in use. The aluminum pole is durable and powder coated to prevent chipping and peeling. You cannot rotate the umbrella. It is too heavy to lift. You cannot move it easily from one place to another. 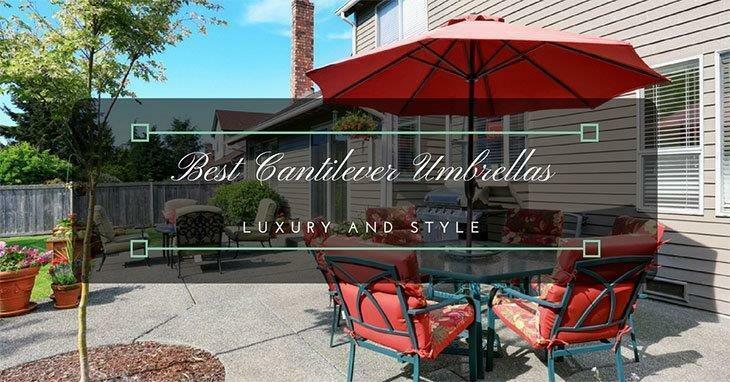 If you want to make your backyard or patio look classy and stylish, this is the best cantilever umbrellas. You can put stylish chairs and furniture in your patio and extreme the unbeatable comfort of sitting under the sun. 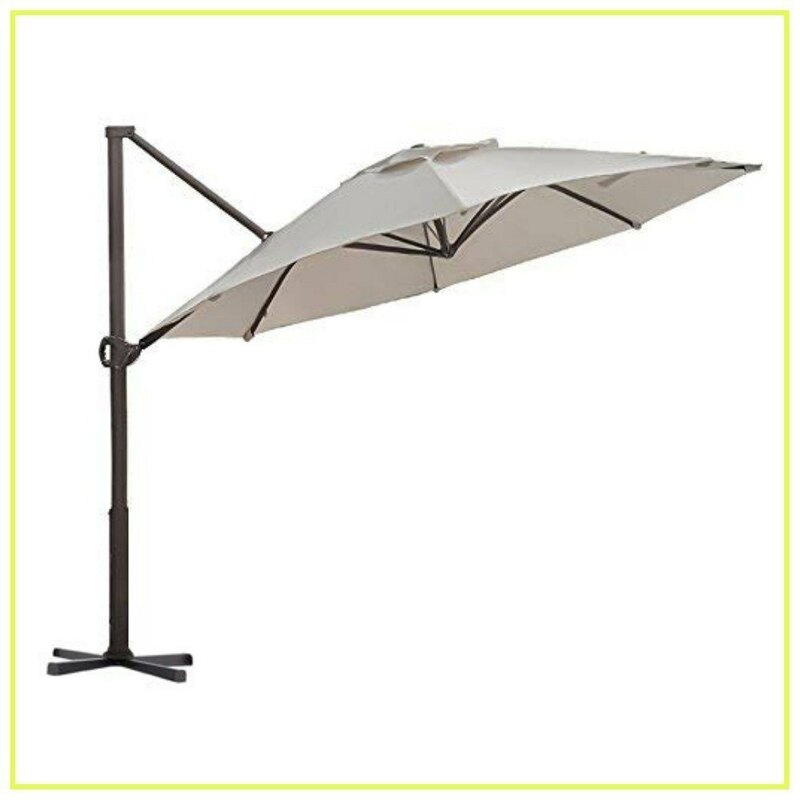 Christopher Knight Home Bayside Umbrella is a great addition to your bayside outdoor furniture. It possesses amazing decorative elements which totally transforms the look of the bayside. While choosing Outdoor furniture bayside, you want to make sure that they are suitable for outdoor living. When you buy the Christopher Knight Home Outdoor Umbrella, you don’t need to worry at all. It gives you amazing shade to beat the sun. The aluminum pole it comes with a Bayside powder coating. The polyester fabric is water resistant. If you forget to take this umbrella indoors when it is raining, it won’t get affected. The weather resistant fabric, pole and base makes it a durable umbrella. 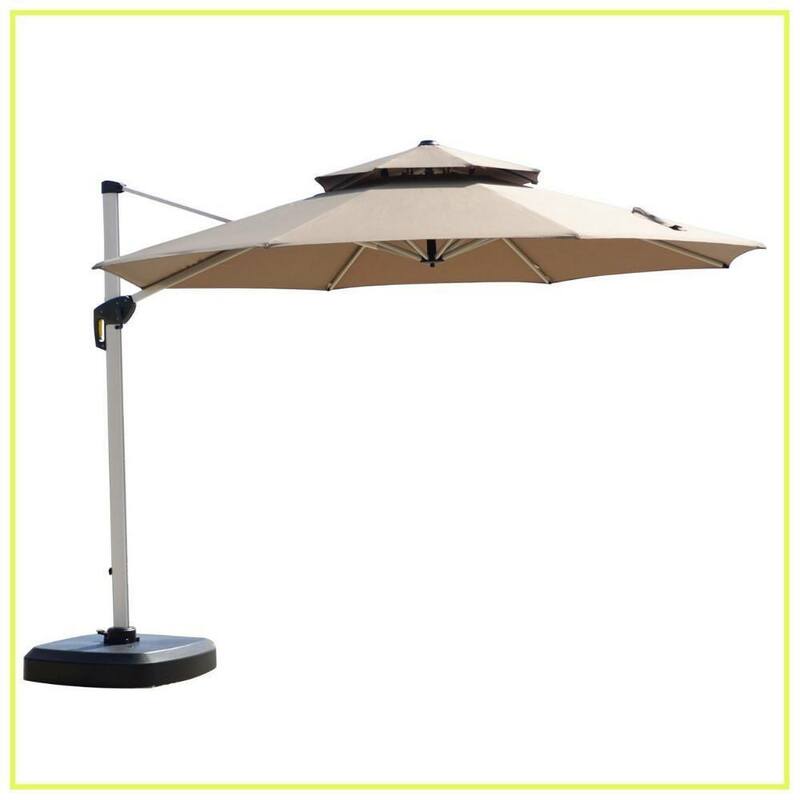 It is a 9.8 ft umbrella which gives you optimal shading area. This is an adjustable tilting umbrella which also rotates at an angle of 360 degrees. The base is not very strong. You have to buy the parts and accessories separately. Its round shape canopy that has a diameter of 10ft has steel ribs that are coated with a bronze powder that keeps them from chipping off, peeling, rust and even corrosion. This also applies to its pole. It has a cross-base that needs weights of about 200lbs to secure it. It comes in three colors; coffee, burgundy, and beige. Durable to due to its counter rust and corrosion properties. Health friendly due to blockage of UV rays. Does not come with weight for securing the base. 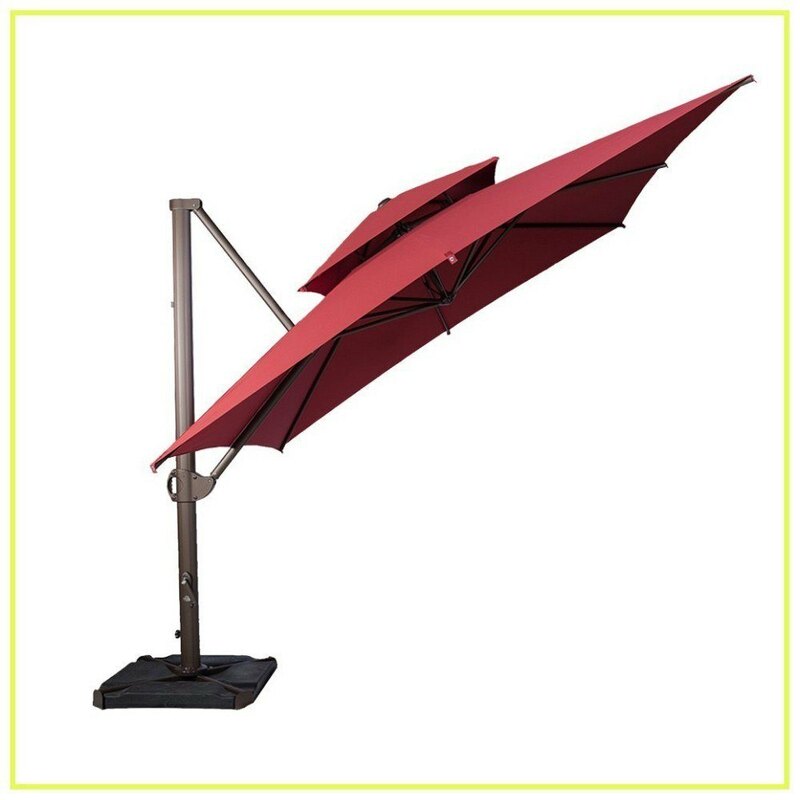 This patio umbrella is an outdoor market hanging umbrella that comes with eight steel ribs and cranks. Does not come with a cross base but can be fixed in the opening of an outdoor table if the diameters are the same. Does not need weights when fixed to a table. Does not come with the weight and cover. Abba Patio Cantilever comes with a cross base and protective cover for the umbrella. This cantilever is best suited for shading large areas like patio conversation and dining seating sets. With a canopy of 11 inches in diameter, it shades any 72-inch rectangle or oval table that holds between six to eight seats. It is by far the patio umbrella that shades the largest area of 95 square feet. It has a fade resistant fabric that blocks up to 98% UV rays. It has up to five tilt position hence ensuring that you are entirely shaded from the sun. This cantilever's cross base and Strong aluminum pole ensure the umbrella remains firm at all times. It has counter rust and corrosion components that ensure durability by being coated with bronze powder. Lastly, it has an air vent that facilitates circulation hence retaining cool temperatures. It comes with a cover and cross base. It covers the largest area compared to all. Does not come with weights. 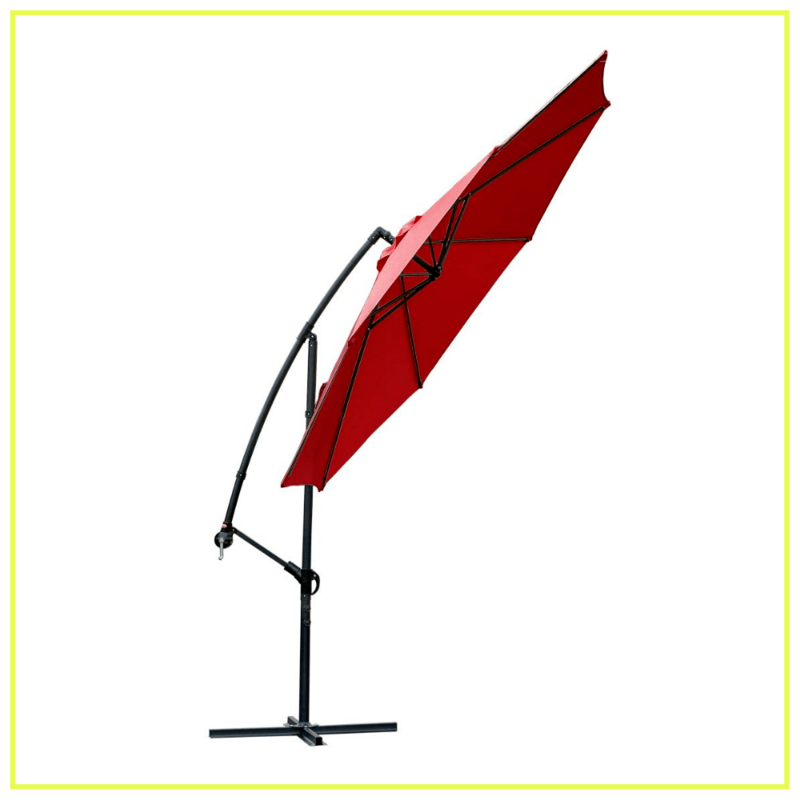 Le Papillon Cantilever Umbrella is also known as Side post umbrella, Side mount umbrella or Roma umbrella. 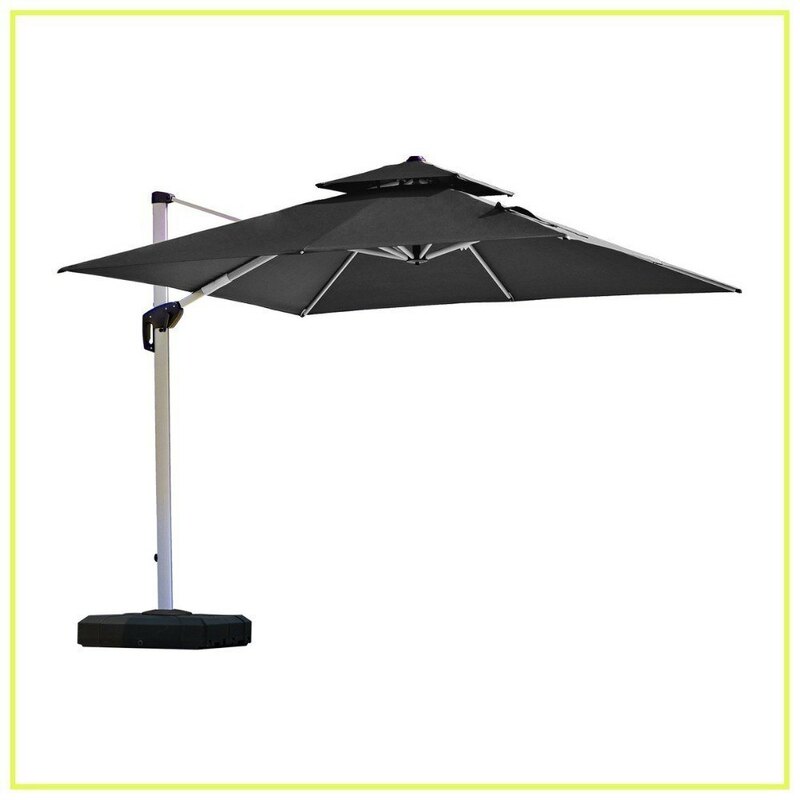 It is an offset patio umbrella that is designed with an easy to open lift with a 360 degrees rotation. This off design ensures you enjoy and all day shade since you can always rotate it to prevent the sun from any direction. 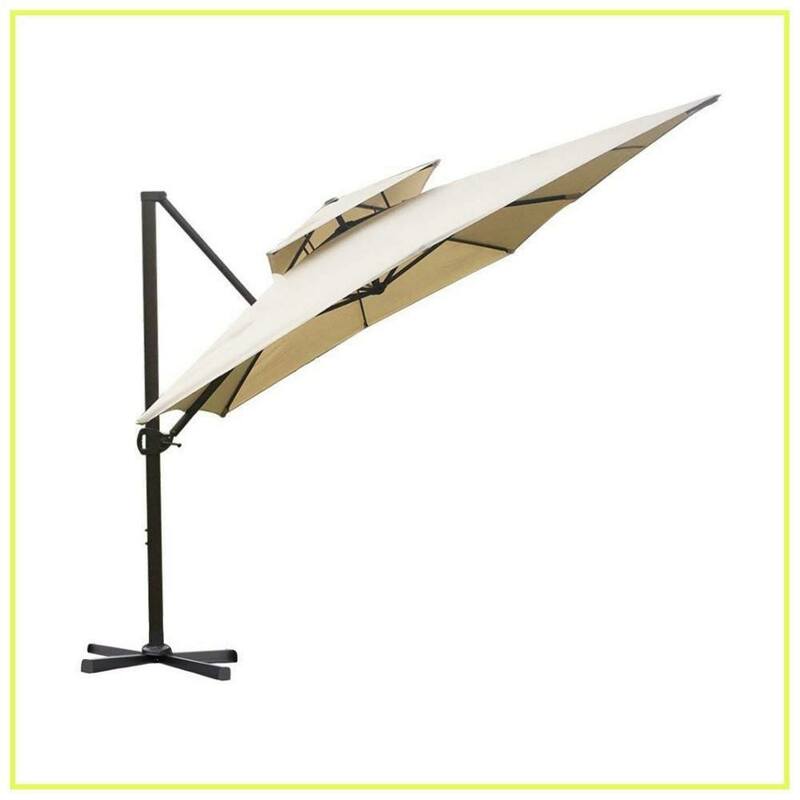 Le Papillon covers a larger area hence providing more shade than the market table umbrella. 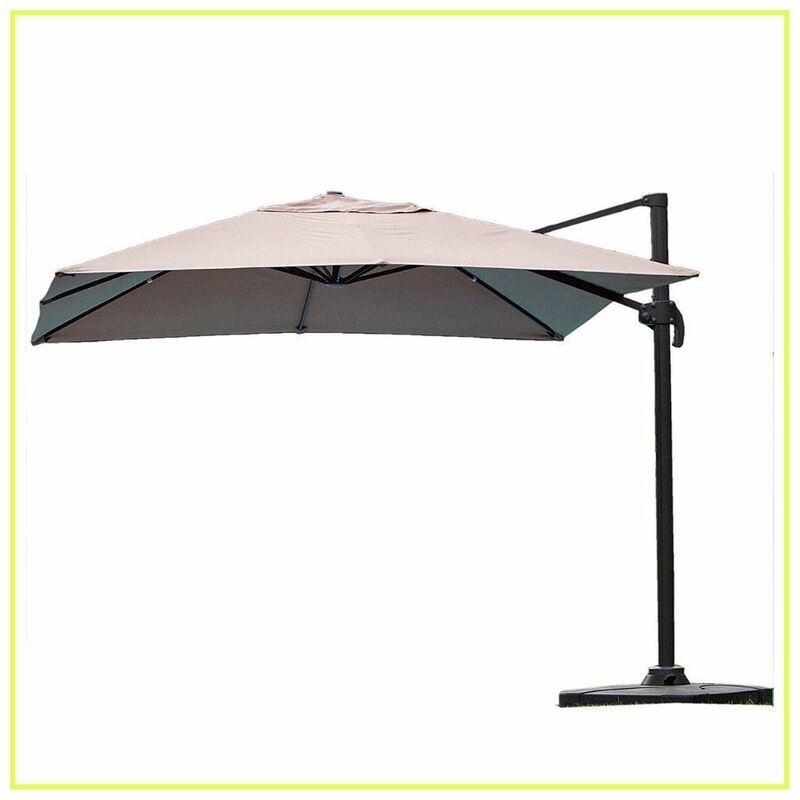 It's weather resistant and oval shape design ensures more stability than the market and offset hanging umbrellas. Le Papillon has an easy to open lifting system that permits opening and extending it in your desired motion as well as cranking to your angle of choice using the model's slider mechanism. It's 100% polyester fabric also blocks 98% of UV rays. It is fitted with rust free poles and oval ribs that counter corrosion too. This cantilever is among few that have a wind vent that allows the circulation of wind and heat which reduces pressure and as a result providing stability. Le Papillon has a very low maintenance cost. Suitable for both commercial and residential use. High flexibility due to its 360-degree rotation component. Can be a little bit too heavy. Does not come with base weights for support. Does not come with the protective cover. A cantilever umbrella is a big umbrella specially made to provide shade in a garden, yard, back yard, porch or a patio. They come in different size, shapes, colors, and functionalities. If you want to protect your eyes from the afternoon glare of the sun, you should buy a cantilever umbrella which matches the size of your space. If you want to place the umbrella over a dining table, you should measure the table appropriately. You want to make sure that you choose the umbrella which covers the table precisely. It is always good to buy a big umbrella because it obviously provides you more shady room. However, you need to make sure that the umbrella does not overpower the table. While choosing the cantilever umbrella, you want to make sure that it has the ability to stand the test of times. You are going to place it outdoors. It has to have the strength to deal with harsh weather conditions. Therefore you need to make sure that you consider the fabric of the umbrella while purchasing one. Ensure that the fabric you choose is water-resistant. The best fabric in the market is Sunbrella. It provides you the optimal amount of shade and protection from the UV rays. A polyester is also a good option. It is also fade resistant and weather resistant. Cantilever Umbrellas need to have strong and sturdy frames. They should have the tendency to survive harsh weather conditions. It is always a good idea to put away your umbrella when the weather is rainy or windy. However, there are times when you totally forget your umbrella outdoors. You should choose a steel or aluminum frame which is made to last. Aluminum is a metal which has the ability to handle high winds. Because cantilever umbrellas tend to get dirty easily, you need to make sure that you have the ease of cleaning them. You can save yourself from the trouble of scrubbing the umbrella if you choose an umbrella which is easy to clean. There is no specific way to use a cantilever umbrella because they come in various models and features. The only common thing about their use is that they provide shade and that they all need a cross base and weights for support. Cantilever Umbrellas are a great solution for you if you want optimal protection from the sun. They provide a touch of beauty to your outdoor décor as well. Nowadays, there are countless cantilever umbrellas available for you. You need to know your budget, need, and specifications before buying the best cantilever umbrella. I would recommend you to buy Elite Shade Sunbrella Umbrella for your patio. This is a handy umbrella which makes your patio a comfortable place. You are able to get relief from the blazing sun with this simple addition in your backyard. The crank system of this umbrella is quite convenient. You can open and close it without any hassle. This umbrella is ideal for residential and commercial use. All in all, all the above cantilever umbrellas come with amazing features. All you need to do is evaluate your area where you want to place it and the size of the umbrella.